A group of crows in called a murder. A group of pheasants is called a bouquet. And a group of flamingos is called a flamboyance, which is strangely befitting because everyone else I know who lives in the cult of flamingo has been at least a little eccentric. Go figure. But perhaps none of us are so flamboyant as the creator of America’s favorite flamboyance, Don Featherstone. In addition to inventing the original pink plastic lawn flamingo, Don was a talented artist, industrial production designer, and general badass in the wardrobe department. And while I have long admired Don for his innovation and a life well-lived, my biggest shout out goes to him as a husband who liked to dress up in matching outfits with his wife. Sadly, Don died yesterday, leaving his wife, his family, his friends, and millions of now-fatherless plastic lawn flamingos behind. Can the rest of us in the flamboyance carry on the tradition in his absence? I don’t know, but I’m going to do my part to pick up the slack. You can read move about Don, his wife, and his life in flamboyance here. 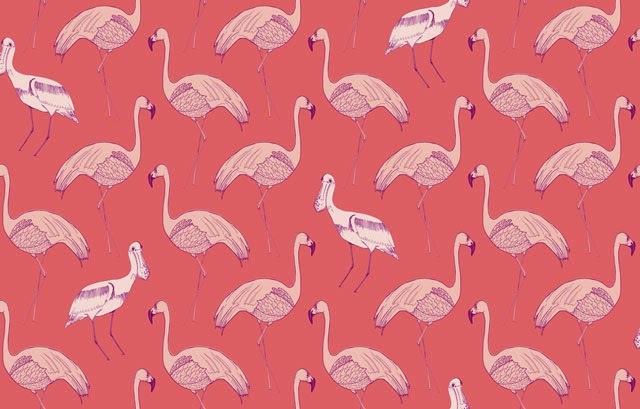 It’s official: Flamingos are The Unofficial Bird of 2014. They are pink. They are rad. They are everywhere. What was I saying? Oh cupcakes! Do you need an easy, non-flammable, totally festive cake topper FOR UNDER A BUCK? You can buy a package of 18 of these awesome honeycomb flamingo drinking straws at Dollar Tree. For a dollar. One. One dollar. They also carry pineapple straws (The Unofficial Fruit of 2014), but the flamingo situation is off the hook! I went in for a can opener and came out with all kinds of flamingo themed goodies (see here). High snaps to Dollar Tree for delivering to flamingo crazies like me, but if you don’t have Dollar Tree stores in your area, you can also find some similar beauties here. The straws come multicolored in the pack. This one had five red and white straws so that’s what I used for the photos here. Because it makes pretty like that. I’m not going to say what happened to the other 13 blue/green/yellow and white straws from the package, but let’s just say there was onion dip and a gal named Margarita involved. 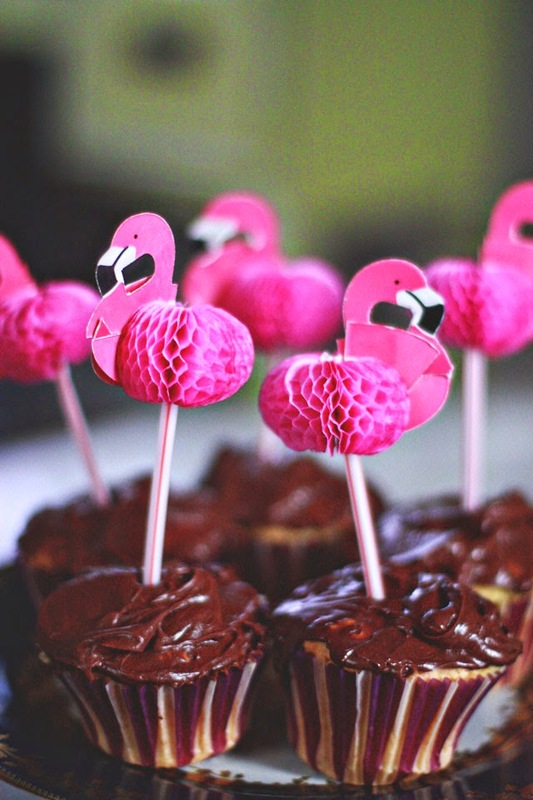 Flamingos and chocolate y’all: it’s a winner! 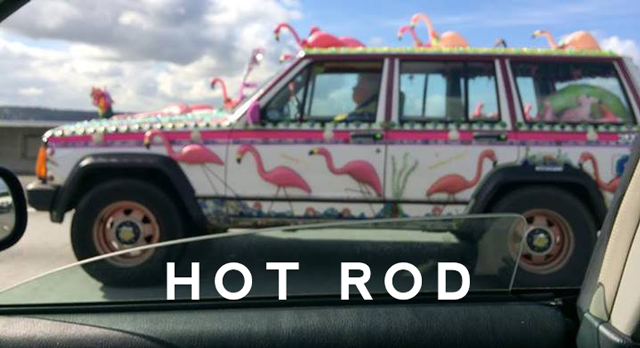 There is someone in Seattle driving around in a Flamingo car. It’s not me. And it’s not Macklemore. I’m turning this moment of jealousy into an opportunity for public awareness. So, to my peeps in Washington state; if you ever find yourself on the highway and see this woman, you need to give her a honk-out. Not just for me, but for all of us. It’s like some sort of Stevie Nicks meets Lilly Pulitzer extravaganza. On a car. And it drives. I’m not the one driving it, but okay, I’m a big girl, I can move past this. Now, I don’t actually own a vehicle, but if someone reading this has experience affixing things to a car, preferably in a way that can be done quickly under the darkness of nightfall, I would love to hear what you have to say. Feel free to email to me directly, as I have friends and relations who might read this and become suspect. I don’t want to ruin the surprise. Did y’all see Mariah Carey’s penthouse on the Today show last Friday? 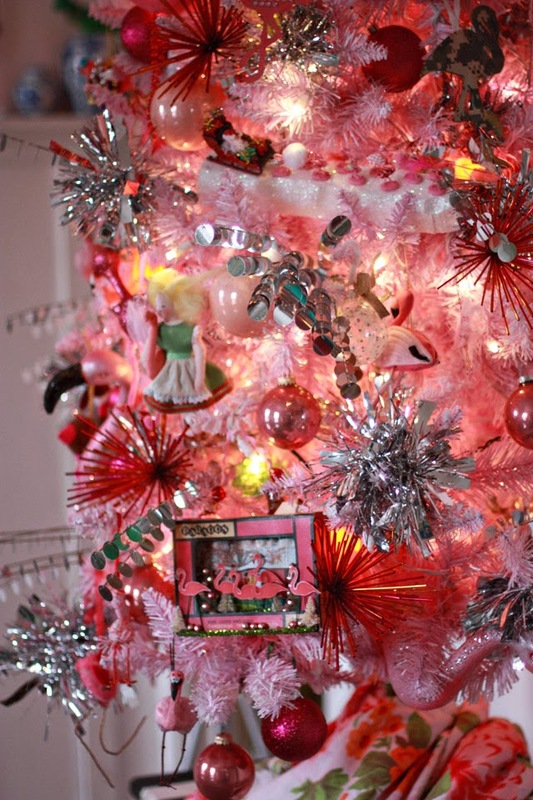 It’s decked for Christmas in 20 kinds of pink. Pink flowers. Pink ribbons. Pink pillows. Steel Magnolia style. 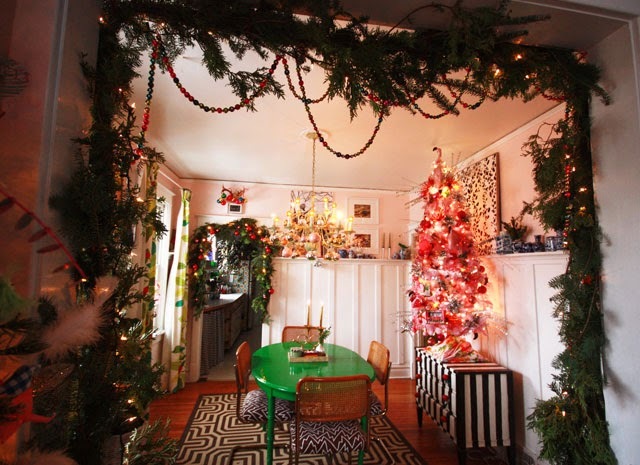 Mariah came off drunk and greedy, but you have to admire the woman’s taste in holiday décor. Also, it takes some big hairy balls to put silk flowers on a tree and then ask for them to be comped on national television. Tasteful. 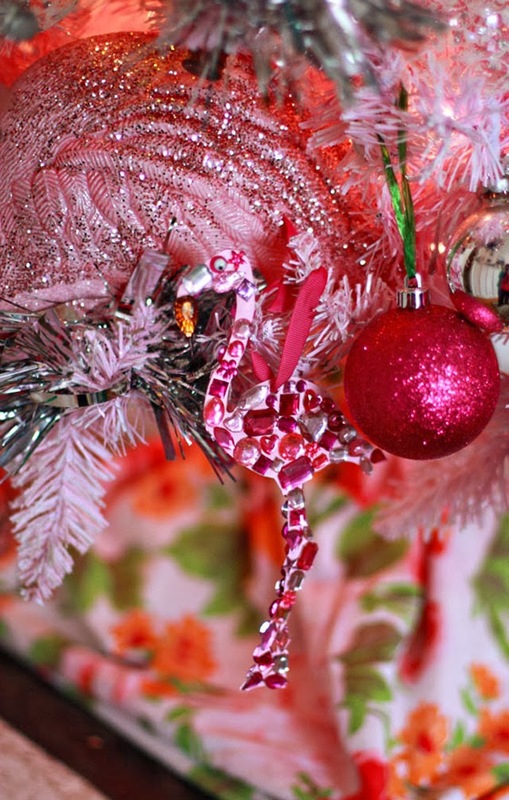 Unlike Mariah, my pink tree is not decked out with flowers but with a far more elegunt alternative: flamingos. 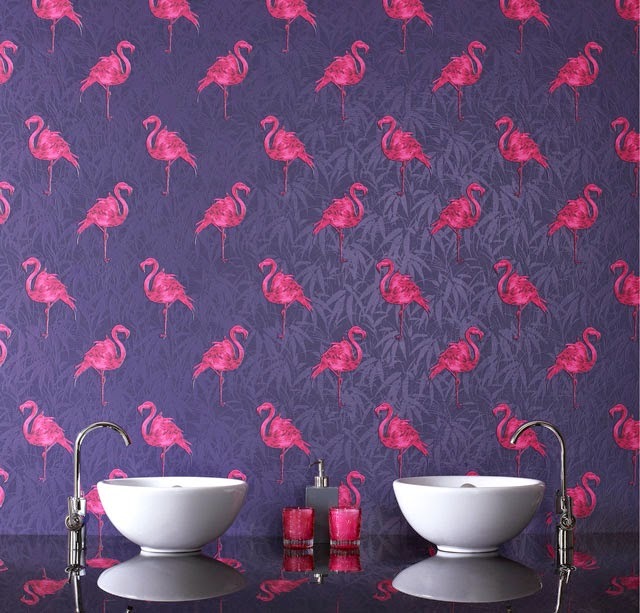 Did you know a group of flamingos is called a flamboyance? I think we talked about this before. 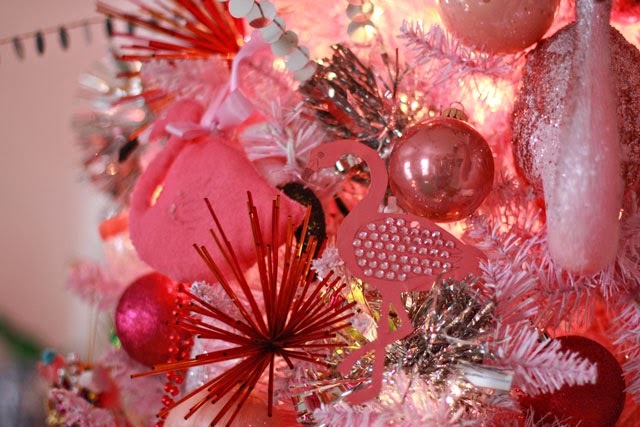 Another thing we talked about – my need for more flamingo ornaments. I asked if anyone wanted to trade, and to my amazement, a lot of people answered! Okay. Let’s talk about this. For one thing, to my shame and horror, the flamingos I sent out were not nearly as sparkly or elaborate as most of those I received. 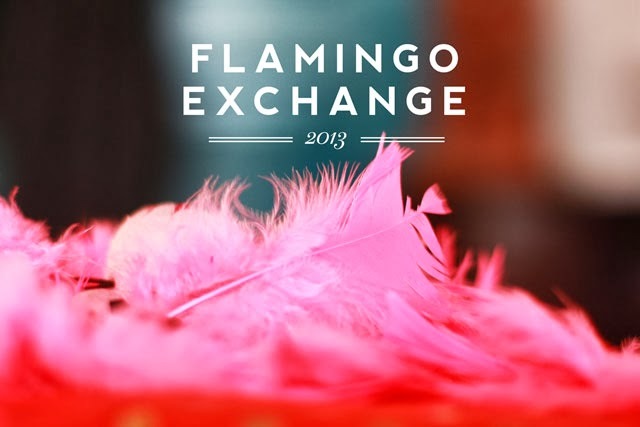 (BTW: If you signed up to exchange, you should have seen my flamingo to you in your mailbox last week of November. If by some odd chance you didn’t see yours yet please let me know asap). For another thing, WHOA. You guys are crazy talented. I mean, I sorta expect the people who read this blog are creatively inclined, but this was not expected. I hardly know how to thank people or even where to begin showing off these marvelous creations. Things are a little blurry here because my camera is freaking out trying to handle all the reflections. I so wish you guys could see this in person. At night, I just like to turn on the lights and stare at it all night listening to Hall & Oates sing Christmas carols. (below) Okay, starting at the top right, a greenish flamingo from Elizabeth who is in the army. The green is camo duck tape, so I can say with some confidence that I am the only person in the whole world with a camouflage Christmas flamingo. Don’t be jealous! Below that is a long sleigh drawn by, of course, flamingos. It’s more of an art piece than an ornament but until I get a mantel to display it properly, the team is living on my tree. 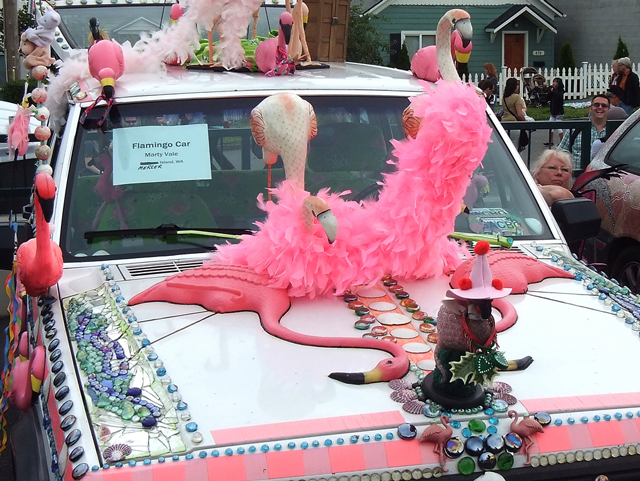 This is from Jill in Wisconsin, whose has been collecting flamingos for decades and puts my menagerie here to shame. She sent pictures from some of her collection and I’m so jealous I could spit. Either spit or steal. I might have to steal some. Wisconsin isn’t that far and I totally have her address. Don’t tell Jill I said that. 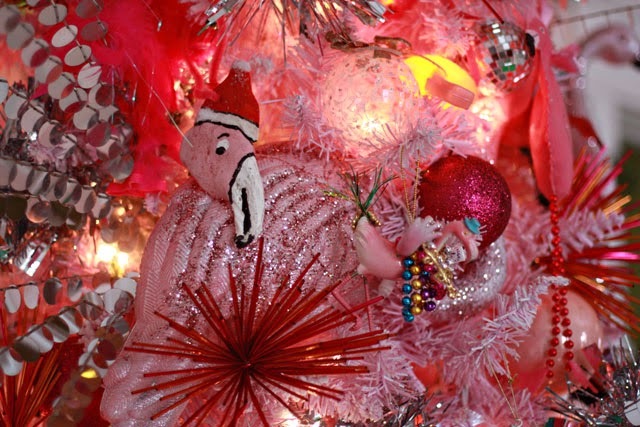 (above) Center, slightly to the left is an ornament of Alice in Wonderland and a flamingo, which is like a three-dimensional version of the illustration in the book. It was a gift from my friend Ann a couple years ago, and in part, was what inspired me to collecting for a flamingo tree. Ann, this is all your fault! 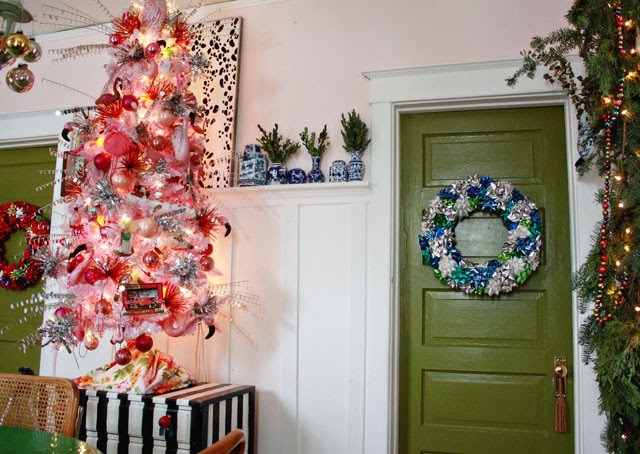 At the bottom center is a diorama reminiscent of a 1950’s television filled with paper clippings and vintage ornaments and bits of sparkly pipe cleaners and…and….oooo! It’s so gorgeous. What a treasure! It might need to stay out year round. 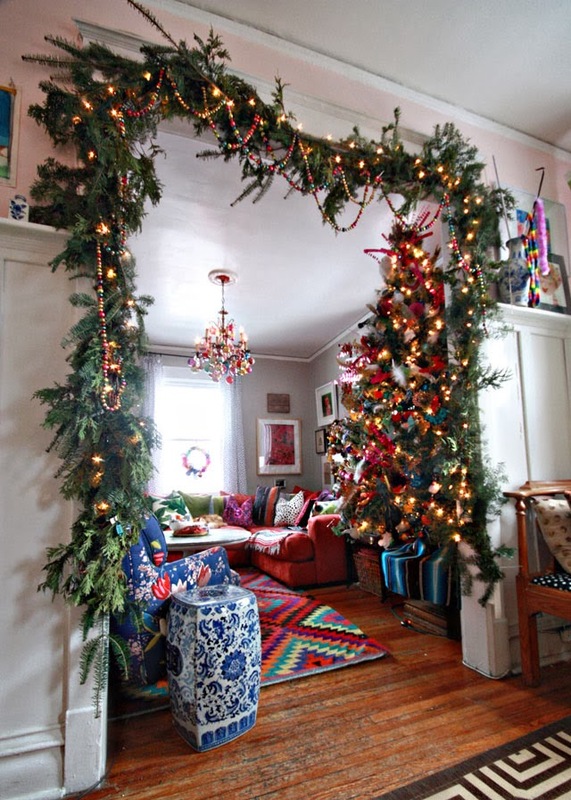 It’s from Beth at Dime Store Chic. She has oodles of lovely vintage bits in her store — go and have a look. 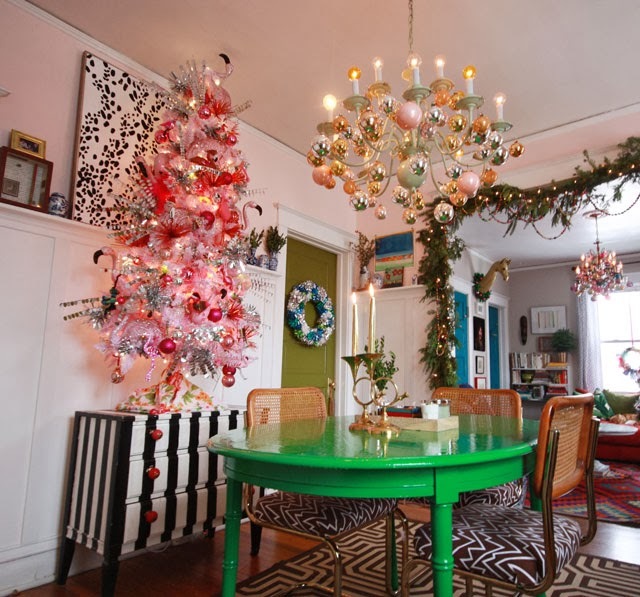 (above) That one the left is one multiple salt dough flamingo ornaments sent by Joan in Maryland. Why did I not think of that? I made salt dough ornaments years ago, but they didn’t come out with this kind of character. 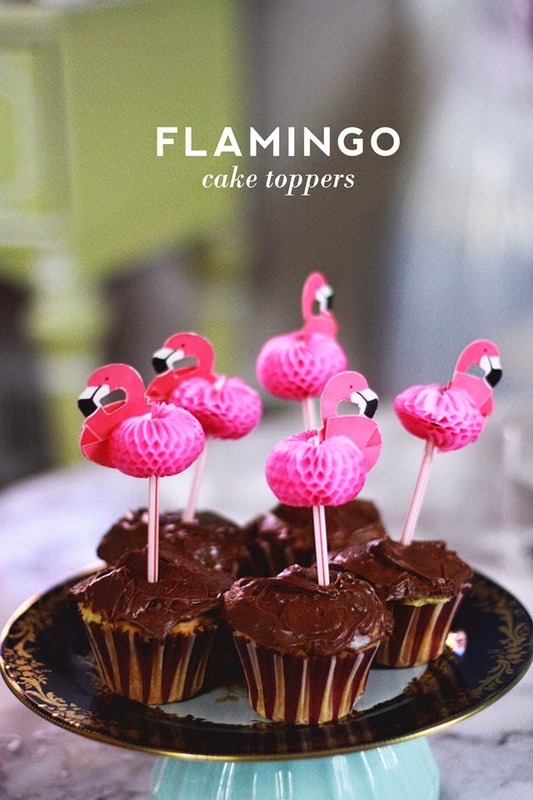 Also, this makes me want to make flamingo cookies for Christmas. Why do they not have flamingos wearing santa hats cookie cutters? Jerks! The one on the right is from Carol, who wrote my most favorite email ever: “Your flamingo is boxed up and ready for the post office. He had to make a stop in the basement for some beads, because he understands the true (second) meaning of the season: It’s Almost Mardi Gras!” So true, Carol. So true. Next to him with the red bead legs is one of several flamingos from Alexandra. 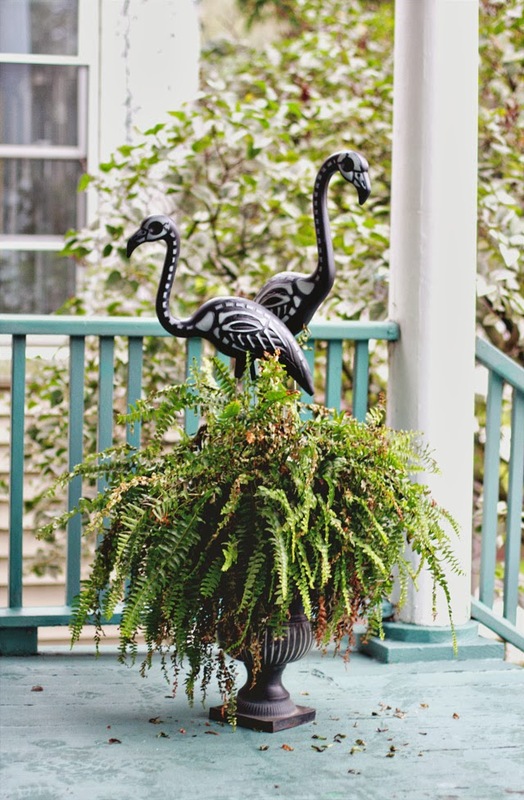 Alexandra sent a small flock of flamingos all the way from Australia! And, and, and, she sent a mini painting of Lola. Actually, it was her cat Merlin who sent it to Lola. Assuminng Lola is okay with me sharing her gift, I’ll show it to you after the holidays once I get a chance to frame it up. You can see more of Alexandra’s lovely painting work here in the meantime. (above) This one is from Kim in Gravenhurst, Ontario. There must be 50 rhinestones on this fella, and more sparkles on the back! I have named him Liberace, for obvious reasons. This little guy came from Erin the Creative Broad. Jeepers, talk about quality! I really wish I got a better shot here so you could see the stitch work on this piece. The wings are all hand sewn sequins. I cannot even imagine the putting something like this together. If you are a sewing person, you will appreciate her blog. Go see it! (Below) At the tip top of the image is a flamingo from Sara in Toms River, New Jersey. I’m 90% sure it’s made on a gourd but I’m not positive. All I know is that it’s glittered and feathered, which are my two favorite things so he is hanging front and center on the tree. (above) This one here in the brown sweater is Topio the Flamingo, all the way from Niina in Finland. FINLAND. I have a flamingo that flew in from FINLAND. And he has A FANCY NAME. Folks, this is about as exotic as it gets in my book. In addition to his fancy name, Topio came with a custom little velvet hat, hand knit sweater, and beaded legs. I found myself poking around looking to see how Niina put it together, and I can’t. No knots or threads or anything. The craftsmanship here is mind boggling to me. To the right of Topio you see the beak of a large flamingo which I made. 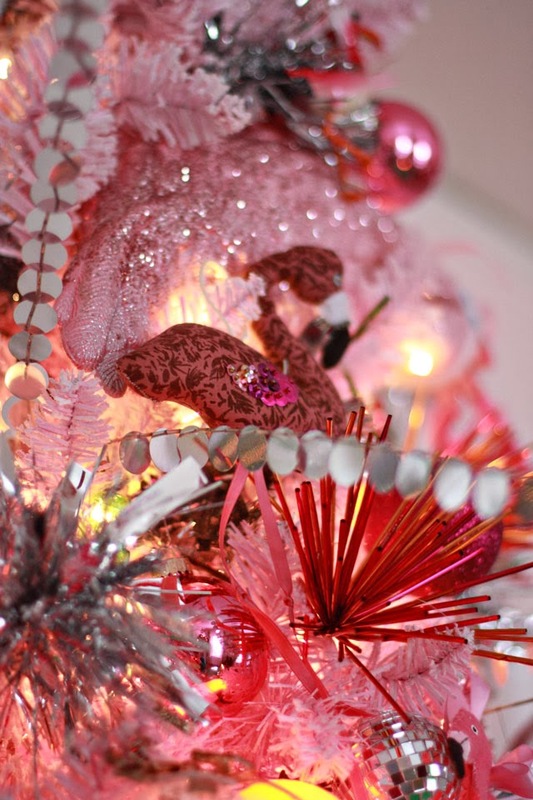 Actually I made twelve of them by glitzing up regular plastic flamingos and using them for the base layer of the tree. If you follow me on Instagram, you may have seen their festive saga in progress. The flamingo situation on the tree is so dense I’m thinking of expanding to other areas. 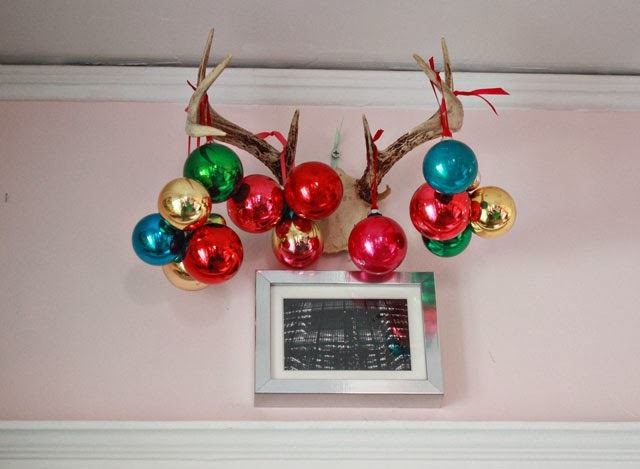 I fear it is not kosher to hang flamingos off deer antlers, so until I draw a firm opinion on that matter, I’m doing it up with balls. Also on the ball front in the dining room, we have another chandelier. You might recall I was considering taking down this fixture last fall because the color was blah and the bulbs were so bright. Now I’m thrilled with it! I swapped out the bulbs for some low-watt oversized string light bulbs and rimmed each branch with glass balls. The ornaments hang from binder clips (office supply section, hayo!) latched on to the rim of each branch. 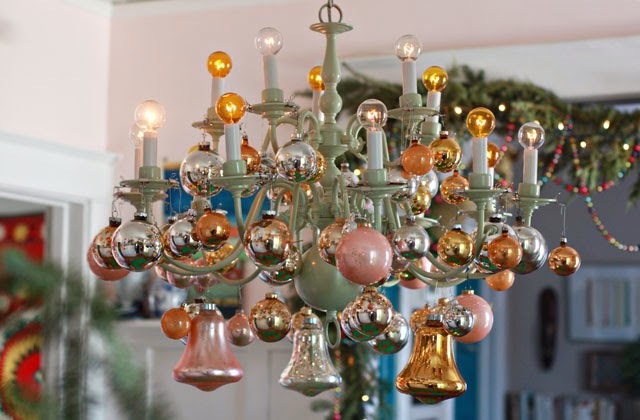 You could do this to just about any light fixture if you so desired. Not going to lie, these babies might be staying up past New Years. Then I might swap them for disco balls. I’m classy like that. 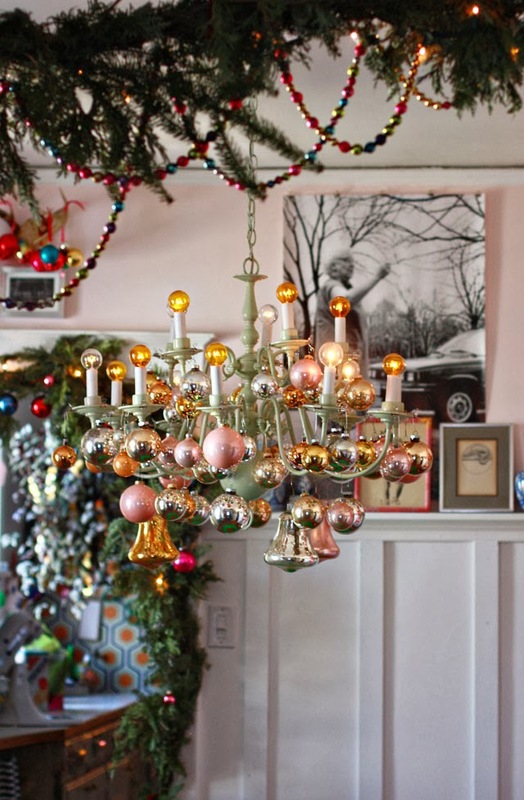 Chandeliers make everything magical, don’t they? No fancy centerpiece for me. I would like one but this table is used non-stop, especially for holiday projects, so I keep everything restricted to a little tray and some candles. Easy on, easy off.That’s as much as I can handle. This concluded the end of the dining room tour. Just next door you will find more trees in the living room and kitchen. Next up, the bed and bath.The bathroom now has a light-up faucet, It’s not Christmasy, but you are going to want to see it. I know. It’s exciting. Thank you again to everyone who contributed to my flamingo tree. They will be treasured for many years. I tied little tiny tags with your names onto each piece so I will be sure to think of you every time they come in or out of the box. Not that this is coming down anytime soon. Flamingos forever! So here is a thing. I need more flamingos for my Christmas tree. And by need I mean want, but whatever. This is important. 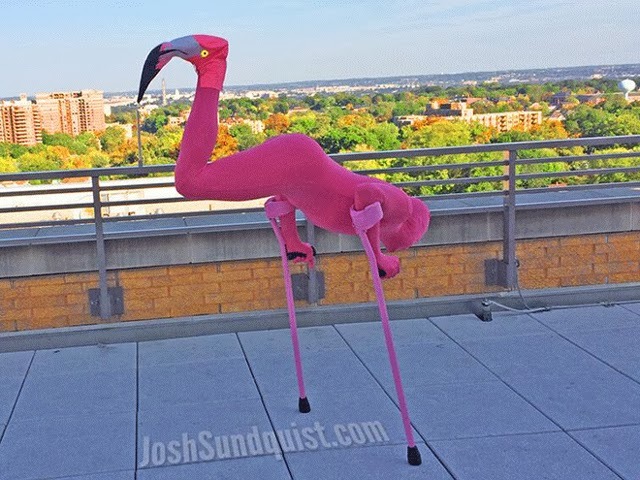 Now, I know for a fact that there are at least, like, ten other crazy flamingo people who read this blog. Maybe eleven. Maybe more who are hiding in the bushes. And I’ll bet at least some of them are crafty, amiright? Right. So I am proposing an exchange. With me. 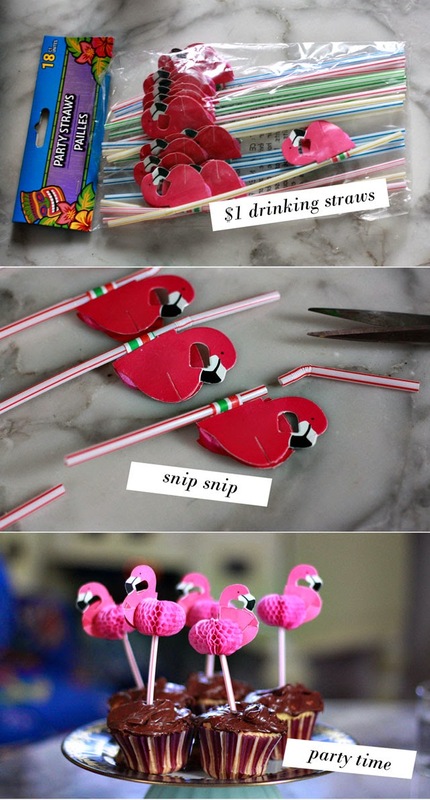 Who wants to exchange homemade flamingo ornaments with me? 24 hour update: Flamingo exchange is maxed out. Come back next year! See, ever since the valentine exchange started a few years ago I have been toying with the idea of an ornament exchange. However, because the valentine exchange is almost too-big for me to handle on my own anymore, I want to keep this one as small and streamlined as possible. And because this is my blog, I get to set down self-serving limitations. I like flamingos, thereby, this exchange is limited to flamingos. The ornament need not be fancy, it could be a simple cut-out or a child’s drawing or such…so long as it is a flamingo and can be hung on a Christmas tree type of thing. I won’t ruin the surprise by showing you a picture of what I am sending, but I can tell you now it involves real feathers (read: if you are offended by the use of feathers, this is probably not a good trade for you). So here is what I propose: You email me before November 25, we exchange mailing addresses, we both commit to sending our mingos free by end of this month, that way we get to enjoy them all December. 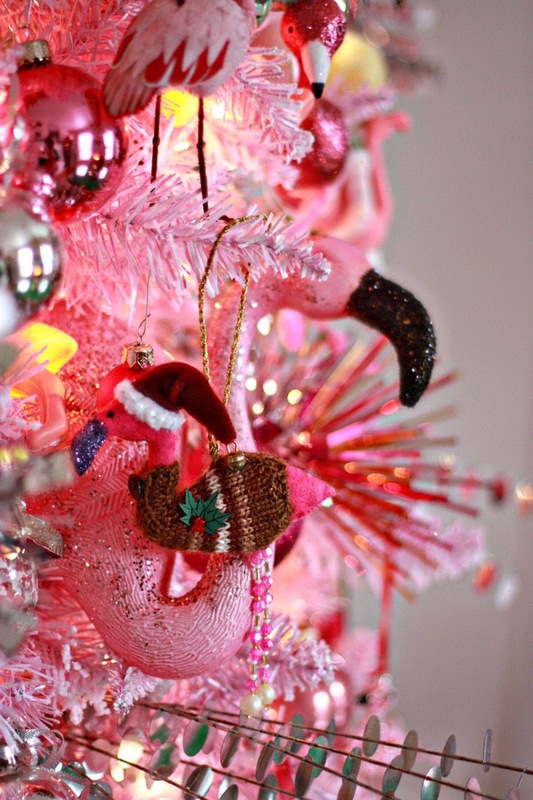 I’m thinking the demand for this will be limited (not everyone wants flamingos on their tree, can you imagine? ), but I have 30 already made and ready to go. If 30 people email me before November 25th, I’ll update this post to indicate the exchange is closed. 24 hour update: Flamingo exchange is now closed. I see a couple of names in the comments from folks who want to sign up but have yet to send me an email — please send an email asap so I can get a final head count. Thanks! So, I thought the flamingo costume I made for Abigail a couple years ago was pretty rad. …annnnnnd then this dude showed me up. Josh Sundquist, ParaOlympian, motivational speaker, lemonade-from-lemons maker, has one leg and a badass attitude. Also, great taste in birds. Hat tip to Jessica from Mad in Crafts for sharing this in the first place. 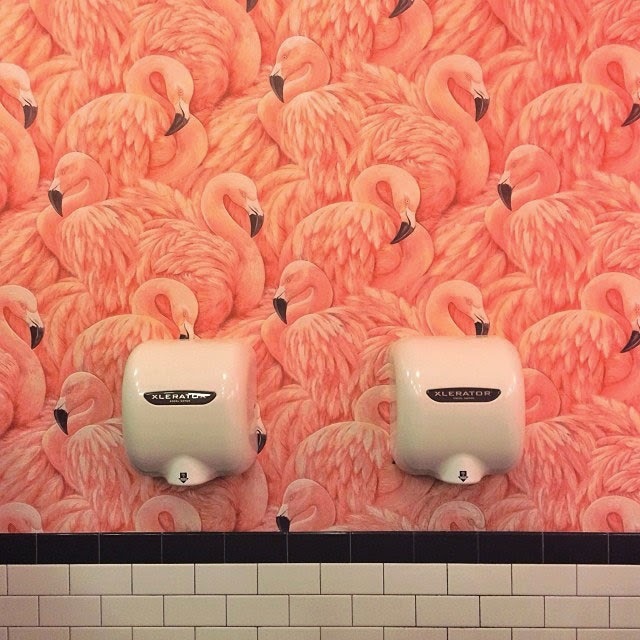 Flamingos rule! 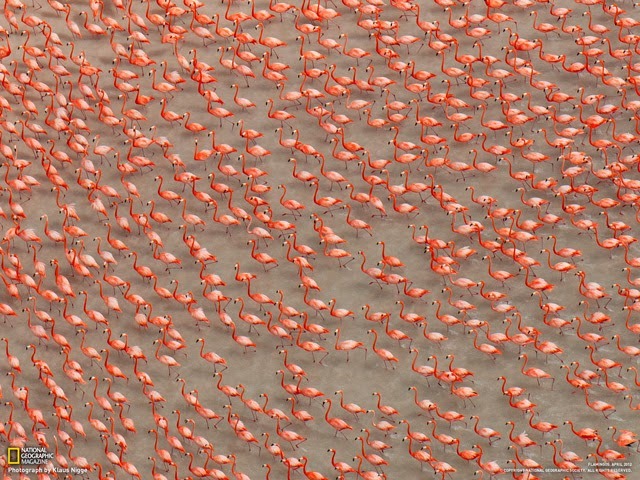 Do you know what a flock of flamingos is called? A flamboyance. A flamboyance of flamingos. A group of peacocks is called an ostentation. A group of crows is called a murder. A group of coots is called a covert, and a bunch of starlings is called a chattering. That’s all I can think of right now. The list goes on much longer than my memory at this moment. Man, bird groups sure are cool! Whoever is coming up with these names deserves a gold star. I, on the other hand, deserve Halloween themed skeleton flamingos. If the fern looks skeletal too that’s on purpose. Okay not really. I’m bad at gardening but whatever. I have skeleton flamingo lawn ornaments, I am now cool by default. You could probably DIY these on your own, but I bought my pair for $12 from Flamingo Pink Inc, the local flamingo manufacturer just down the road aways. Yes, it’s good to have a flamingo factory in the area. These two came in a cardboard coffin (perfect for handing out candy) and a bunch of free flamingo swizzle sticks, soon-to-be bedazzled and hanging on my flamingo Christmas tree. Flamboyance indeed! Something I was recently informed: The term turd burglar is notoffensive, while the term Indian summer is offensive. Well now I know. And now you do too. So lasted weekend, while most people were outside enjoying a Native American summer, I decided to skip the 70 degree temperatures outside and stay indoors and with the windows open. I have a weird thing about open windows – they make me crazy productive. Emphasis on crazy. I know my brain chemistry well enough by now to identify the correlation between brief surges of warm weather and brief surges of prolific industriousness. Working. Cleaning. Crafting. Cooking. Saturday I stayed up late felting flowers. Sunday I woke up at 3am and decided it would be a great time to rearrange furniture. And swap out the rugs. And wash the walls. 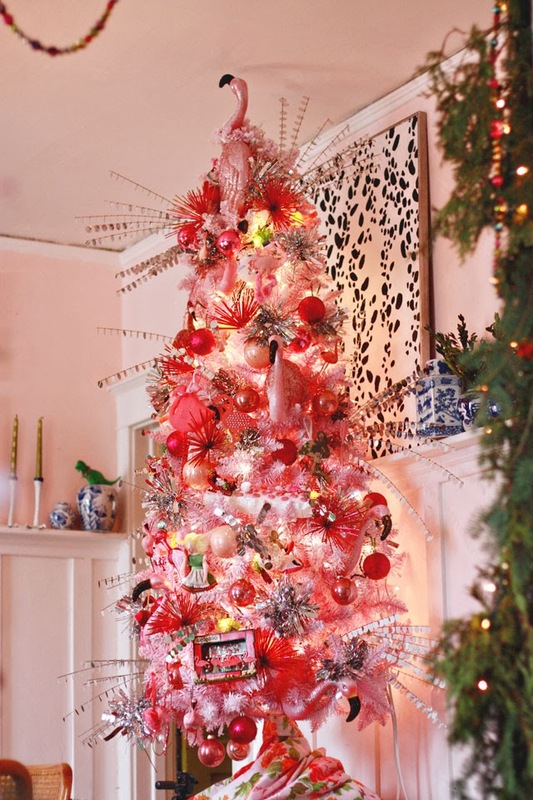 And set up the pink Christmas tree. And color my hair. While making meatballs. Before 11am. Why? Because I felt like it. I realize feelings like this must seem bizarre to some people, but I’m now at a point in my life where I not only accept it – I embrace it. It feels so good to accomplish things. As long as I can keep my mind busy and my hands occupied, I’m happy. The hard part is when the weather changes and the cold crashes in…there will be a day or two of adjustment (like this morning) when it’s a struggle just to get up out of bed. Ahhh, Winter. You have a cruel sense of humor. Speaking of humor – my friend Ann sent me a set of reindeer flamingos. 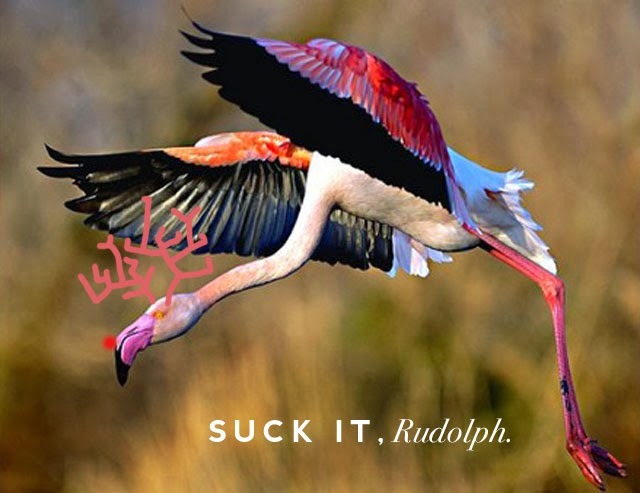 Let me repeat: Reindeer Flamingos. I suspected they were from her the second I saw them, but there wasn’t a note and my thing for flamingos isn’t exactly secret, so I called the factory to ask where they came from (plus, let’s be honest, I always wanted an excuse to call a flamingo factory). They were soooooooo nice. Turns out they even threw in some extra flamingo gear, including these swizzle sticks, which Lola promptly tried to eat. Since they were so nice and the factory is in the area, I am going to take a tour in a few weeks. Can you even imagine touring a flamingo factory? Oh man. I have visions of a How’s It Made video ala Sesame Street. Stay tuned! PS: Just in case you were wondering, it’s not too late to buy a Turkeymingo (scroll to the bottom). It has hints of both pilgrim and Native American flair. Way to be PC, Turkeymingo.